For those who feel like they are missing out on a classic winter Christmas experience while Aussies celebrate with barbecues and beach holidays, there is a solution. With the event growing in popularity, there are plenty of Christmas in July events to keep you busy in Sydney this season. Just a short drive away, you can experience Christmas in July where the idea first began, in the festive Blue Mountains. The team at VroomVroomVroom has put together a few ideas to help you plan your Christmas in July celebration. If you would prefer to stay in the city, there are plenty of events marking the occasion across Sydney. Take a Christmas in July cruise on the harbour, or take the kids to Luna Park to participate in special winter activities. Also worth a visit is the Woolwich Pier Winter Festival, where you can enjoy a family meal at the Woolwich Pier Hotel. They are not the only ones putting on special menus for the occasion, with restaurants and cafes across the city getting into the spirit of Christmas. The Blue Mountains are a fantastic place to celebrate Christmas in July. The season as come to be known as Yulefest, and many establishments around the region put on special dinners for the special occasion. The idea for the event began in Katoomba, and the Blue Mountains have been raising the bar every year since its inception. Enjoy Yulefest in a beautiful mountain setting. Every Friday and Saturday night throughout the month, enjoy a delicious five course meal made from local ingredients at the historic Hydro Majestic. There is no better place to imagine a festive, winter Christmas than this Blue Mountains gem. There may even be snow! Take the kids to Jenolan Caves this winter for a chance to meet Santa. The local restaurant will also include a festive menu to celebrate Yulefest. Take the chance to explore some of the spectacular caves while you are in the area. Enjoy a Yulefest luncheon in picturesque Leura at the Bygone Beauties Treasured Teapot Museum. 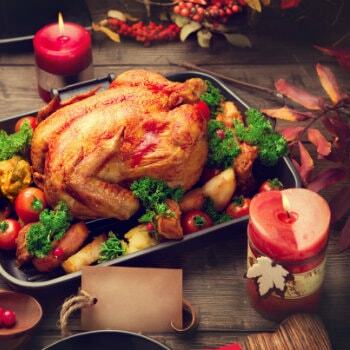 Enjoy a festive meal with traditional Christmas foods. Be sure to book ahead to make sure you don't miss out. Visit Katoomba's Carrington Hotel and take advantage of special accommodation packages. Each Saturday night guests can enjoy a great Christmas-themed menu with food such as turkey, seafood and plum pudding. Lunch menus are also offered at the venue.